Life is meant to be a learning experience from the cradle to the grave. We have been given the power of choice as to what we want to learn or even if we want to learn in this lifetime. Teaching others can be a occupation that can also lead to being a preoccupation depending upon the subject, teacher and student attitudes and the overall classroom environment. Our world's problems are usually created because individuals and the groups to which they belong have put the true educational process on hold and continue to practice and preach outmoded or inadequate thought forms. Teaching and learning the piano most often brings out the very best in everyone involved. Richard Clark now at age 74 has garnered many keyboard teaching experiences since he began 50 some years ago. 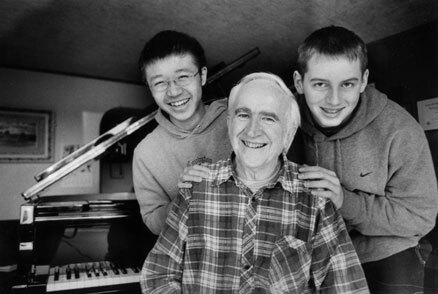 His students Donald Yung (15) and Dylan Haines (14) are piano less and both come to Clark's home to practice on his grand piano in the front room window light. Donald plays 2 hours almost everyday and also goes to Stafholdt to entertain the residents. Dylan plays one hour most days but also plays high school football and other endeavors to round out his life.